We reached Salzburg!! We looked around us and saw the mountains the Von Trapps roamed in and Julie Andrews sang in at the beginning of the movie we all know! Another thing that made the city of Salzburg exciting to me was being in the same place as my dad and my brother. Both my dad and brother served their missions in Austria. Both of them served in Salzburg. Our first morning there, after we checked into our hotel, we were at the bus station trying to figure out which bus to take. We looked across the bus station and there were 2 missionaries. I felt a little like I was seeing my dad and brother and what they would have been doing and looked like. We asked them about the bus system, they gave us directions and we were on our way and they were on theirs. Both were from Utah. I really enjoyed meeting the missionaries. 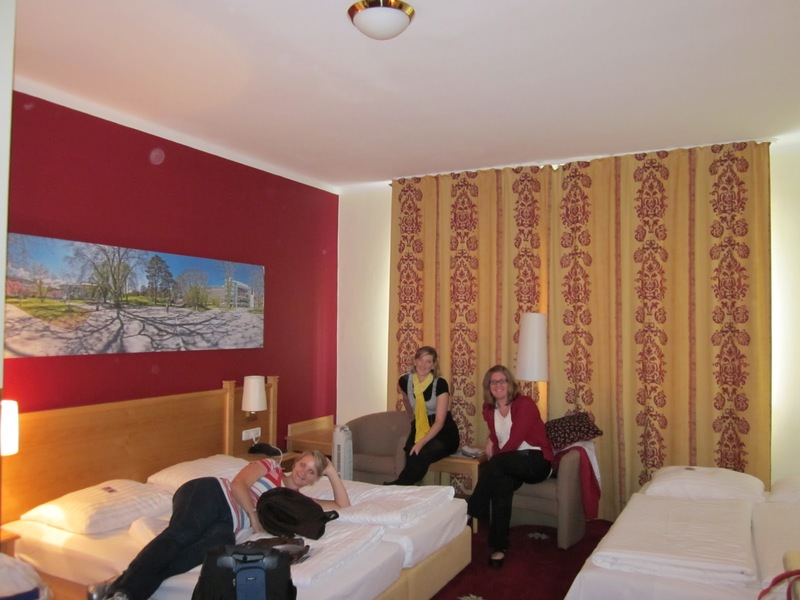 We arrived in Salzburg and went straight to our hotel. It was awesome!! It was a big room with enough for us four and one of the best things about it, is there is a tub, not just a standing shower with thin walls keeping the water in. 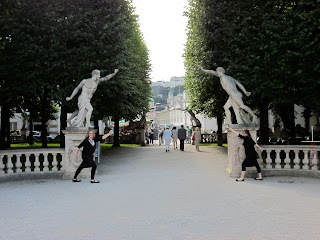 Our first destination was Hellbrun, the estate outside Salzburg where the gazebo from the Sound of Music was moved. The grounds of the estate were turned into a public park, and so you can walk and kids can play on the playgrounds. But tucked away in the corner of the park, is the gazebo. Of course we had to take pictures of us skipping around the gazebo. 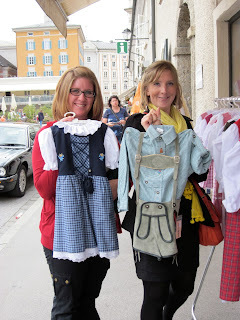 We took the bus back into Salzburg and walked around the city. We stopped at Salzburg cathedral, where Mozart started playing the organ, he played there for 2 years, where he was baptized. 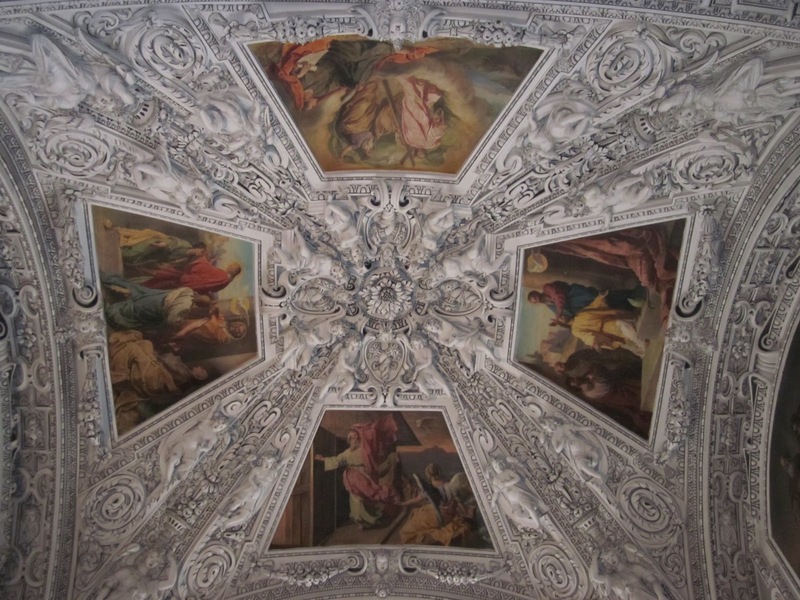 The ceilings were intricately carved and the walls were painted with golds and bold colors. There is a huge pipe organ with 4 pipe groupings sitting right over the entrance. 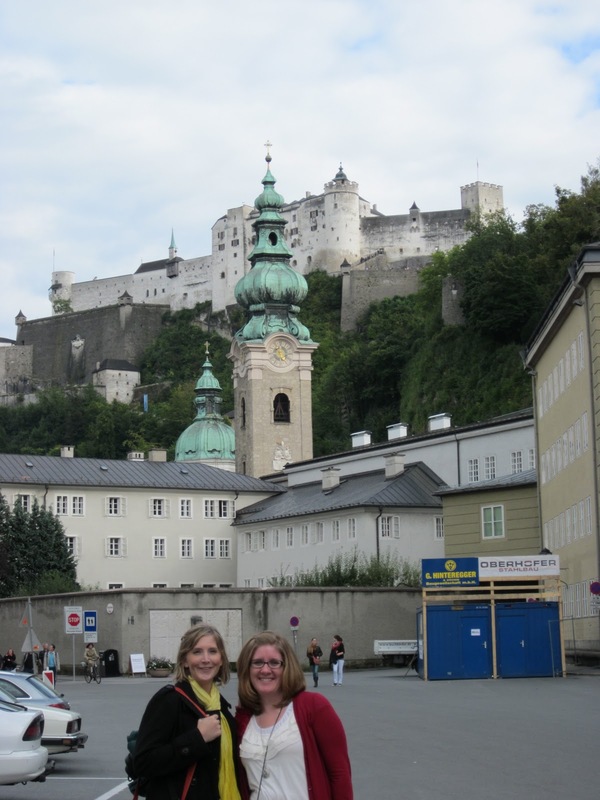 As we walked we came to the wall and parts of Salzburg where in the Sound of Music, Maria sang her confidence song. There was a square with a fountain where Maria sang this song and flicked the water. We walked through the square where in the movie, the Nazi's were marching into the city. Our next stop was St. Peter's, which is the inspiration for the graveyard scene in the movie. Nearby there is entrance to the concert hall where the family sang together before fleeing from Austria. We weren't able to get into the concert hall, it was under construction. So we continued walking and checking out the main shopping streets. I finally bought a purse here. I needed something, the pouch I was wearing was giving me a little rope burn. Dinner in Germany and Austria consisted of a lot of sausage, which I didn't mind at all. Potatoes and sausage, yes please!! 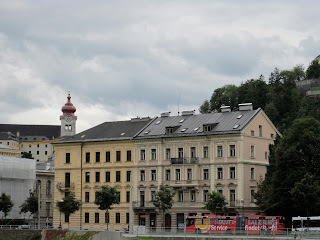 As we were walking, we got to see the fortress on the hill, which is what constitute the Salzburg skyline. 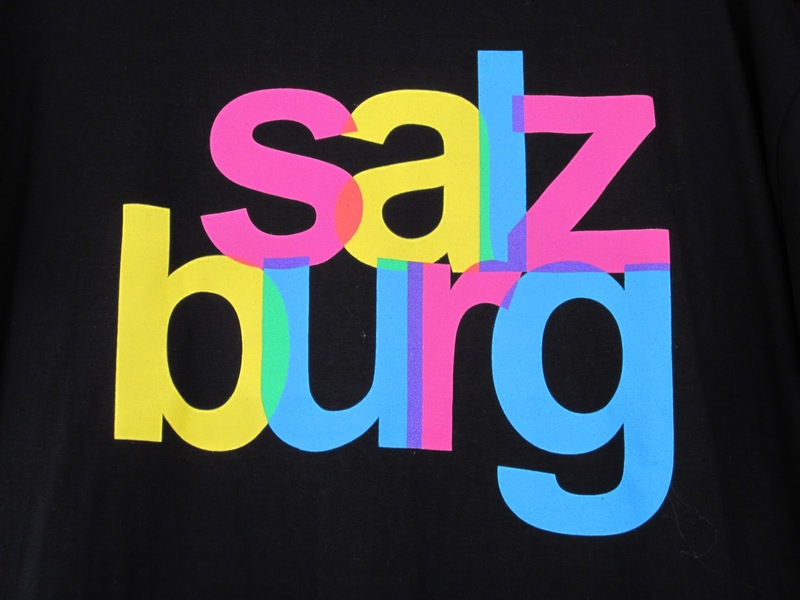 It's the most prominent feature in Salzburg. That night, we went back to our hotel and come to find, there is a channel that just showed The Sound of Music over and over, we fell asleep, in the city where this movie was filmed. So cool! Day 2 in Salzburg was us getting up, enjoying a fantastic breakfast and checking out of the hotel. We then went to Mirabell gardens. You might recognize this place from the movie as one of the places the family went through and sang, "Doe a deer, a female deer..." There were fountains, flowers, the overgrown tunnel where Maria and the 2 boys ran and the little gnome statue the children tapped on the head as they sang. We also walked up the steps they all hopped up at the end of that song in the movie. Pretty much the best thing ever!! 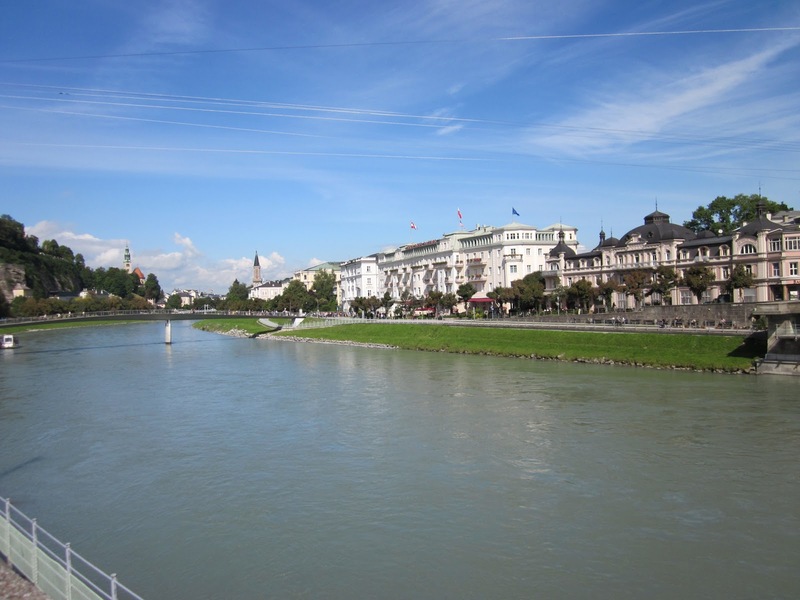 I really enjoyed Salzburg, I thought the city was beautiful, green and the river running right through the middle of it was picturesque. 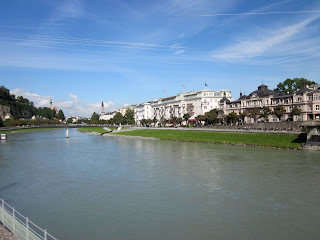 Salzburg was one of my favorite's. Our Salzburg time ended as we caught the train for our ride to Vienna.